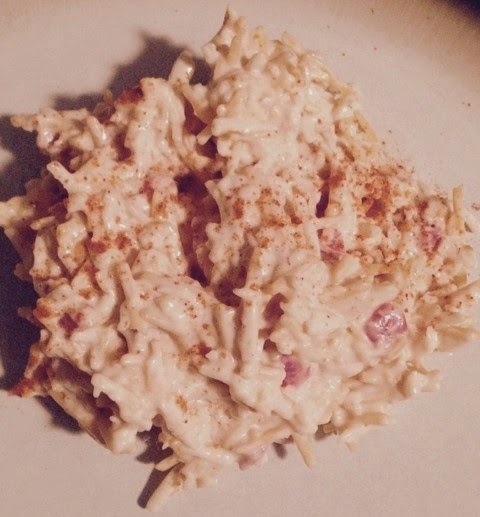 I will be the first to admit that I never liked pimento cheese because it kind of scared me a little. I know that is crazy but, I think it was because I never really knew what was in it until a few years ago. Now knowing what goes in it is partly why I chose it as the first recipe from the cookbook ( I have a deep love affair with cheese). With this recipe I made it to my liking so the amount that I gave is what I used. 1) Drain the pimientos juice from jar. 2) Empty both bag of cheese in a bowl together. 3) Add the 1 & 1/2 of mayo to the cheese mixture. 4) Add pimientos to the cheese/mayo mixture. Stir together. 5) Stir in the next three ingredients into the bowl. Mix thoroughly. Overall, this was really easy to make. You just have to have about 10 minutes free to make it. Also, I made a grilled cheese sandwich with it what I had leftover. That's it for now. Until next time, Laters!!!! !